Podcast Ep. 4 – Simplify Your Life by Organizing! Lots of us would like to live differently than we currently do. We’d like a more convenient home- one story or smaller yard or, maybe even a “close it up and travel” sort of home. We dream about this easier lifestyle, but we never take action…. because we don’t know how to handle our stuff. The weight of all our stuff stops us- we can’t seem to take even one tiny step toward realizing our dreams. 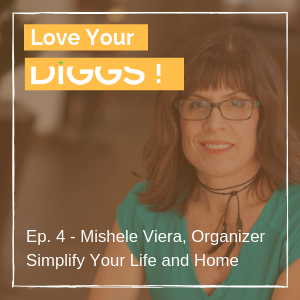 Mishele Viera is a certified professional organizer with 20 years of experience helping people cross this divide. Her calm and compassionate voice is more effective than a therapist’s couch. Find out how Mishele begins the process with thousands of people just like you.